This intermittent fall, a gossamer statement of natural beauty, is for the most part ignored by viewers who are concentrating on the nearby larger falls at Lake Catherine State Park, Arkansas. Until this visit, I was guilty in not noticing it as well. It was worth the wait. The skinny falls you see above are intermittent. They only have significant water during periods of heavy rainfall. A few days before this picture was shot, it could have been a raging torrent. Intermittent falls are like that. Years ago in the film days, I photographed some intermittent falls in the Ozarks that were in the raging torrent stage. I caught these falls after visiting the close by Lake Catherine State Park falls on and off since the late sixties and finding these intermittent falls are lurking in the shadows less than 20 feet from the “main” falls. I should have my head examined for decades of missing this picture. Other than the therapeutic advantages of re-visiting waterfalls, I suppose this discovery is another good reason one should frequent these natural wonders. Speaking of Lake Catherine falls, may I suggest that you digress and go to the Photo of the Week Page at Corndancer dot-com and see the larger falls and get in on how this whole story started. We’ll wait here. 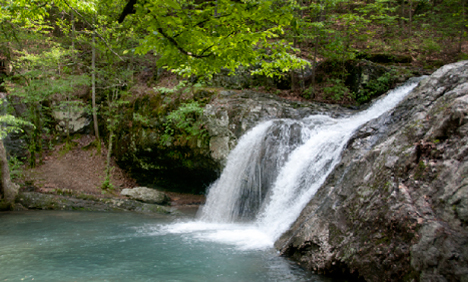 These are the "main attraction" falls at Lake Catherine State Park. The intermittent falls are just behind the foliage in the left side of this picture. Lake Catherine falls are immensely popular with good reason. There is almost always water over the falls and unlike many falls are easily accessible. Lake Catherine State Park is minutes from I-30. 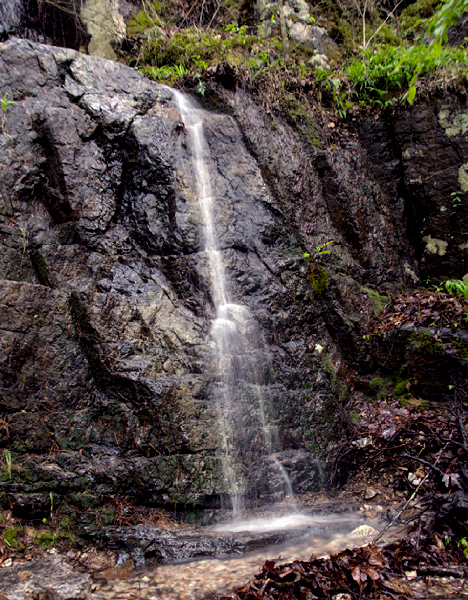 Once you are at the park, a short hike is required to reach the falls. The trail is well-worn and is more like an earthen sidewalk in most places than a trail. It is suitable for all ages. I suppose this is not my last trip unless the higher power determines that it is. All the more reason to have enjoyed it. I generally take the “back” roads when traveling. Returning to my home from Hot Springs is no exception. My back route takes me over Arkansas State Highway 190 which passes through Bookman. Bookman is a rare bird. Google can’t find it. I would not have noticed were it not for the signs. 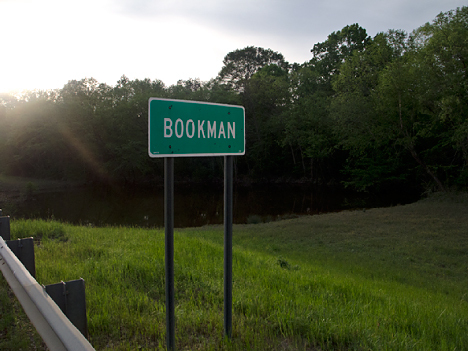 There are two Arkansas Highway and Transportation Department signs emblazoned with "Bookman" about a mile or so apart on Highway 190. The most noticeable thing between the signs is the "dark lagoon" in the foreground. (The backlit picture is a cheesy attempt by me to add some visual mystique to my contention of the possible inhabitant). There’s not much between the signs. When traveling west, the sign is on a bridge approach. The bridge goes over a stream I call “The Black Hole of Bookman,” whose highest use, I have determined from my visual reconnaissance, may be to serve as a residential area for the legendary “boogerman” we all feared as children. I’m serious. It’s spooky. Just past the bridge at Bookman, the Black Hole, which could be the home of the legendary boogerman, the ultimate villain we all feared as children. At this point there may be some semantic conflict. In certain parts of the South, many of us were adults, or nearing adulthood when we learned that in the outside world, this ultimate apparition was known as “the bogeyman.” Being one who more or less adheres to how I was brought up, I’m sticking with “boogerman” thank you very much. Up in northeast Arkansas on a recent trip, I ran across one of the “you can’t make this stuff up” photo opportunities. Seems Dickey Tree Service of Portia AR, uses a retired hook and ladder fire truck in the pursuit of their business. 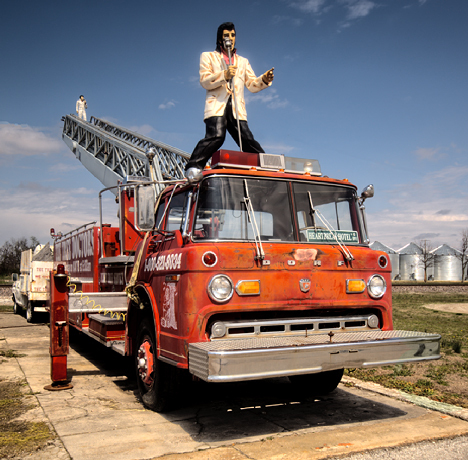 When the truck is idle, the folks at Dickey park the truck beside US Highway 63 and put a full-sized fiberglass Elvis atop the truck cab. It does grab your attention. For the pièce de résistance they install a smaller Elvis at the top of the ladder. We will follow this story in more depth in future editions of Corndancer and Weekly Grist. See more pictures in our Weekly Grist gallery. 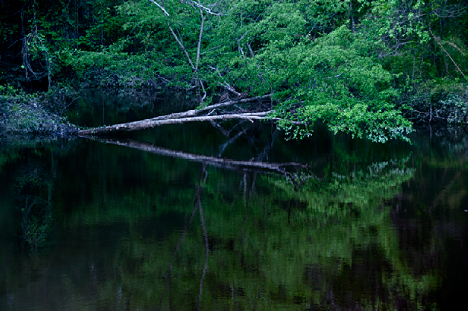 Be sure and check out our Weekly Grist Gallery for more waterfall pictures, Lake Catherine area pictures, including a tree across the trail, and closer to home, what you might think is an approach from the veldt to the jungle, but isn’t by any stretch of the imagination. 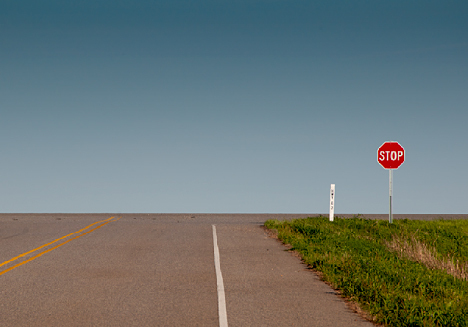 This junction, Highway 63 and Lovelace Road, northeast of Pine Bluff, Arkansas has possibilities as a movie location. You can almost hear the chopper blades whopping on the far side of the highway. And perhaps some Jaws music. After seeing hair-raising rides and finding some minuscule Lady Bugs in a thousand acre plus field, my expectations for the balance of the day did not include anymore “Kodak moments.” However, I should have known better. To access the field where I found the bugs, I had to exit and descend from elevated highway. On the way back, all that goes down, must go up — and lo and behold, there was a road with a sky background — the thing of movie sets. One could envision the Creature from the Black Lagoon, the cavalry, an Apache chopper with guns blazing, or a tank topping the rise with any of the above headed straight at you while you listen to something akin to the Ride of the Valkyries. See more pictures at Corndancer dot-com. Before we go much further with this epistle, may I suggest you digress momentarily and go to the Photo of the Week Page at Corn Dancer dot Com where this story got its start. You’ll see a four-story swing at the Star Daze Festival at Star City AR, some people riding it, and a bigger that life Lady Bug. We’ll stand by here, patiently waiting your return, while you peruse this entertaining and informative page. On faith that something would turn up, which it usually does, I headed toward the Arkansas River Bridge over Emmett Sanders Lock and Dam northeast of Pine Bluff, Arkansas. On past trips over the bridge and the elevated highway one travels after crossing the bridge, I noticed a road crossing under the elevated highway. I figured it was time to check it out. 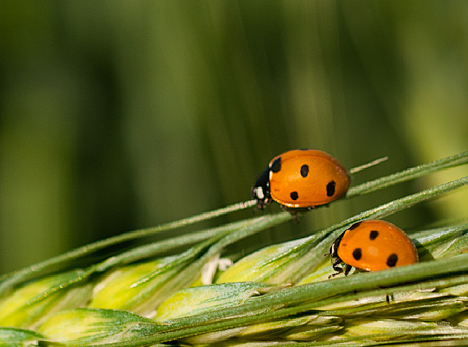 The odds of finding a couple of Lady Bugs in a wheat field bigger than a lot of towns are tall. These critters are stretching to hit 1/4" long. I set up to shoot the wheat. After a few frames, I saw the first Lady Bug, and then the second. Not wanting to pass up this chance, I put my person on the ground at Lady Bug level to record these critters. Some contortion required. The bugs cooperated completely showing no fear of the monster and his equipment pointed in their direction. But then that is their nature. They are beneficial bugs. For all of their innocent appearance, they are predators. And their prey is the pest bugs that damage crops and flowering plants. You just go girls! And finally, it’s never too late! There are some things one can continue to enjoy, regardless of age. 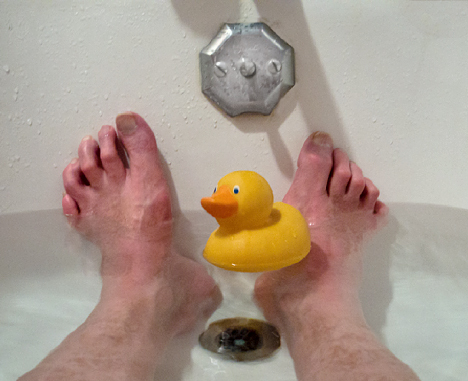 One of those things, I must confess, is a rubber duck in your bathtub. Why not? Certainly, it’s not rubber. Probably some sort of polyetheleynebi-nomialplasticenedi-something or other, but you get the drift. Do something nice for yourself today. See more thrilled riders, festival, ladybugs, and more at our Weekly Grist Gallery. Click on the the thumbnails above. Bigger high resolution pictures. Taking a glance down the Garvan Gardens docks at fine collection of show-room shiny antique and classic boats, all fully restored and 100% operational. 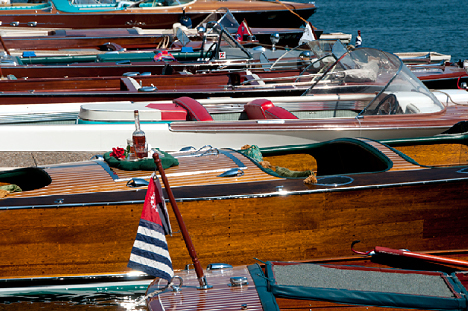 Back in the day, these groovy wooden boats seen at the Garvan Gardens Antique and Classic Boat Show looked every bit as cool as they do today. Trust me on this. I know. I was a wild eyed kid then, salivating over Chris Craft ads in magazines. Now that we have several generations of failed and delaminated, mold and fungus-infected junk fiberglass vessels scattered promiscuously around our landscapes, we can appreciate their wooden ancestors even more. Before we venture much farther, let me direct your attention to the Corndancer dot-com Photo of the Week page where you will see Anthony Chapel at Garvan Gardens near Hot Springs, Arkansas. The soaring 57 foot ceilings of this woodland masterpiece will make you say wow. Shooting and chronicling the chapel was the other part of this trip. Wood, thanks to Mother Nature’s molecular genius could perhaps be the ideal boat-building material because it retains its stiffness better than fiberglass. And stiffness is very desirable in a boat. A stiff boat slices through the water. A non-stiff boat wallows through it. Perhaps some of the latest polymer, chemical, carbon, resin-soaked materials can now match wood, but I’ll be the last to knuckle under and admit it. In the foreground, the Chris Craft Cobra, a mid fifties classic is nearly 18 feet long. 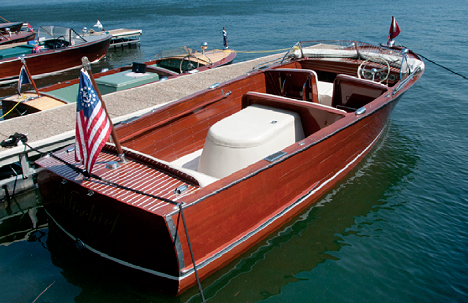 The boats were equipped with a 120 or 131 horsepower inboard engine. In the background is an all-wood 14 Cadillac Boats Venture, powered by a 25 horsepower Gale outboard. These boats are individually owned, restored, and operated, at no small cost, I might add, by members of Heartland Classics, a chapter of The Antique and Classic Boat Society, Inc. As high-filutin’ as that sounds, I found them to be a friendly, outgoing lot who love to talk about go riding in their boats. I recruited a couple of them to keep an eye on a sack-full of Nikon equipment while I shot and they said they’d be happy to accommodate me. I asked them to “slap anyone up-side the head” who even looked twice at the equipment and they readily agreed. 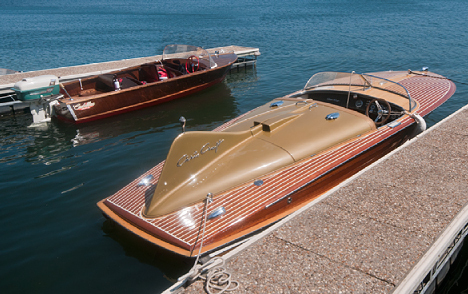 This 1949 Chris Craft Sportsman, “Mischief,” is 22 long and has a 6-cylinder 158 horsepower Hercules inboard engine. The boat is owned by Larry and Jan Hamilton of Moore OK. These are responsible folks and you see a lot of possum-blond coiffures in their ranks. Their boats run from a pristine wooden 14′ runabout with a 25-horse outboard to a 27 foot Italian craft over which I and several others involuntarily drooled. These folks are not top-waters and it takes a significant commitment to play in this league. I for one am grateful for their commitment to preserve parts of this heritage of craftsmanship and beauty — and cheerfully make them available for us mere mortals to enjoy. Click the pic to see more wood boats and Anthony Chapel. See more boats and Anthony Chapel pictures on our Weekly Grist Gallery. I strolled the docks and shot a bunch of boats all of which are in show-room display condition including two classic Italian Riva boats. There are also a couple of other Anthony Chapel and a bunch of tulips who appear to be paying attention to a conversation. A growth of wild cypress on the east side of a stream crossing U.S. Highway 167 north of Hampton, Arkansas in late March, 2011. The glow of a setting sun bathes the scene in amber. 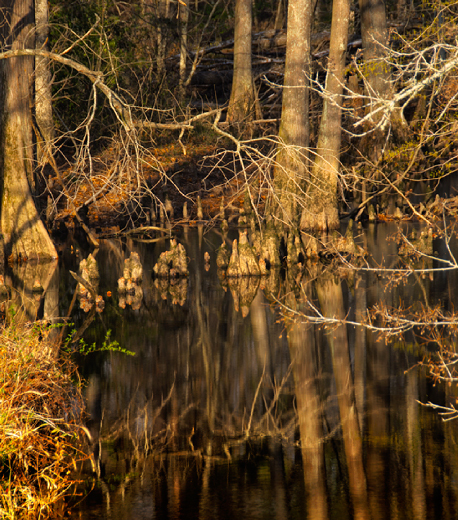 On the wild side, this creek full of roadside cypress growth in south Arkansas, probably ignored by passengers and drivers in hundreds of vehicles passing daily, is a cacophony of color, shapes, angles, shadows, and shades. It is a macro universe supporting a cypress nursery, fish, turtles, snakes, lizards, frogs, and other cold-blooded critters who are probably looked upon as supper for the warm-blooded carnivores who are without a doubt members of the neighborhood as well. On top of all that, it looks pretty cool and nary a soul has lifted his or her hands to manicure it or prepare it for public view. It just happened. And other than the price of gas (no small thing mind you), it is free for all to see. Compare our wild and wooly cypress to the well organized grounds of Garvan Woodland Gardens, near Hot Springs AR. 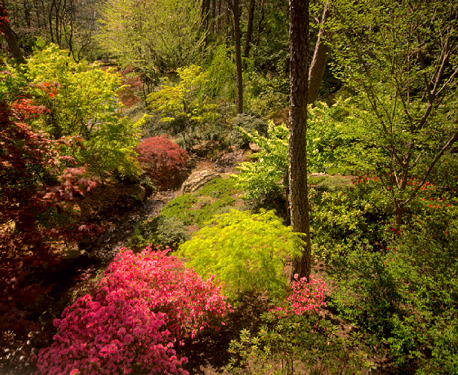 Garvan Gardens is a world-class botanical garden bequeathed to the University of Arkansas School of Landscape Architecture by the late philanthropist Verna Cook Garvan. As opposed to the cypress growth, thousands gladly pay the modest entry fees to stroll through and observe the wonders of nature civilized by well manicured trails and bridges in Garvan Gardens. With its unique woodland chapel and pavilion, Garvan Gardens is the site of dozens of weddings every year. You can see much more of Garvan Gardens on the Photo of the Week page at Corndancer dot-com where this story started. Click on the link and take a look. We’ll wait here. The view from Half Moon bridge at Garvan Gardens in its brilliant early spring mode. A set of steps allows garden visitors acess to get up close and personal with the small stream running through the chasm. Up to and including getting your feet wet. Some would say there’s no comparison between the well organized and tended Garvan Gardens and our wild and woolly cypress growth. I beg to disagree. The same Higher Power created locations. Both are prime examples of their local environments. In their own way, both are eye candy. One may be a tad threatening to human visitors and one has the welcome mat out. Until the Garvan Gardens landscape was tamed, it probably had its share of natural threats as well. Full Moon bridge at Garvan Woodlands Garden goes over a small stream which empties into a Koi pond. 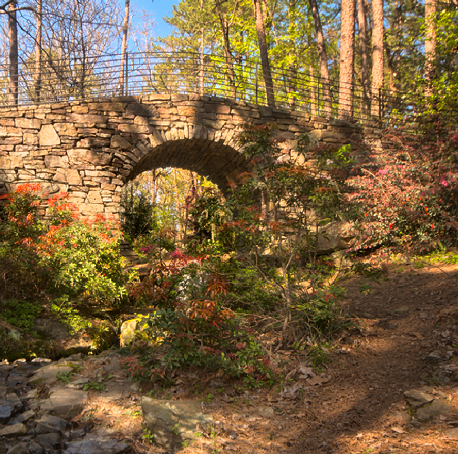 The bridge is part of the well planned system of trails in Garvan Gardens. My observation is that while one location is a touchy-feely and the other is an “I’d just as soon not,” both have value. Both have their place. And we can enjoy both for what they are. So in the final analysis, in my humble opinion, as to the “well organized versus wild and woolly” conundrum, there are no winners and no losers. Just two venues doing what they do best. See more Garvan Gardens and cypress pictures in our Weekly Grist Gallery. You’ll see the Garvan Gardens entrance and its guardian tulips. And you can peruse and ruminate upon the images of more of the bridges and some other cool stuff. There are 13 pictures waiting on you. Still lo-cal, high in natural content and very addicting. Fully guaranteed and warranted to entertain even the most calloused of souls. Click here.